Articles and links to watchdog groups. Links to the latest news and information. A compilation of human rights databases, think tanks and info on key issues. Focus on armed conflict and the U.N. Commission on Human Rights. Country reports, statements and briefs. 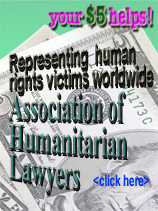 Information and links to nonprofit organizations monitoring human rights around the world and specific countries. Official and nonprofit agencies engaged in programs to develop agriculture and infrastructure in developing countries. With an explanation of the role of taxpayer-funded banks and the politics behind the loans. Links to organizations and agencies providing updates on catastrophes worldwide and ongoing relief projects. Global feminism, articles, and domestic resources. A list of internationally recognized dissident organizations involved in internal armed conflicts or wars of national liberation, along with their grassroots support groups. Domestic organizations promoting social justice, sustainable agriculture, women's rights, ethnic and cultural interests, consumer protection, and other issues. Includes State Department human rights information, Congress, C.I.A., travel information, embassy links and more. New website for women screenwriters: Visit www.filmsprings.com.